Biscop Baducing (this was the name of Benedict before his tonsure) was born in Northumbria in AD 628, of a noble English family. When quite a young man, he stood high in the Royal favour and was rewarded for his services to King Oswiu by the gift of a possession in land suitable to his rank. But, it would seem, to the astonishment of King and courtiers alike, when he was only twenty-five, and had all bright prospects opening out before him, "he lightly esteemed this transitory inheritance in order that he might obtain that which is eternal; he despised the warfare of this World, with its corruptible rewards, that he might be the soldier of the true King, and be thought worthy to possess an everlasting kingdom in the heavenly city. He forsook home, kindred and country for the sake of Christ and his gospel, that he might receive an hundredfold and possess the life which is eternal." This was in AD 653, just at the time that St. Wilfred (the Elder) had determined to leave his country for his first visit to Rome and, as his close friend, Biscop hailed with joy the opportunity to accompany him. Thus, the two friends started off together; but when Wilfred was detained at Lyons, Biscop hastened onwards without him, "being anxious personally to visit and worship at the places in which were deposited even the bodies of the blessed Apostles, towards whom it had always been his wont to feel an ardent devotion." After no long time, Biscop returned to his own country, full of fervour and enthusiasm, inspired by all he had heard and seen in his travels, and from this time onward his life was filled with perpetual journeys backwards and forwards between England and Rome; journeys not lightly or idly undertaken, but each with its definite purpose and each taken for the good of the English Church. Twelve years after his first visit, Biscop returned again, accompanied by Prince Alchfrith, and "on this," says Bede, "as on the former occasion, he imbibed the sweets of no small amount of salutary learning." After a stay of some few months, he started on his homeward journey, but stopped short at Lerins, an island off the south coast of France, where there stood the far-famed monastery of St. Honorat. Here Biscop went through a course of instruction and took upon him the vows of a monastic life. Two years were spent in seclusion and then once more, this time under the name of Benedict, he set out for Rome and paid his third visit to the Papal see. It was just at this time that Pope Vitalian, in compliance with a request of the two chief English kings, was in the process of sending the great Archbishop Theodore to Britain. Being a Greek however, he was in need of someone who might act as his interpreter and explain to him the customs of the English nation. And who so well suited for this as Benedict, most fortunately just at that time in Rome? Accordingly, the Pope, "observing that the venerable Benedict was a man of a mind fraught with wisdom, perseverance, religion and nobleness, entrusted to his care the bishop whom he had ordained, together with all his party; and enjoined him to abandon the pilgrimage which he had undertaken for Christ's sake, and out of regard to a higher advantage, to return homewards to introduce into England that teacher of the truth whom it had so earnestly sought after; to whom he might become both a guide on the journey, and an interpreter in his teaching after his arrival." Benedict, we are told, did as he was commanded and, together, the two arrived in Kent, where they were most cordially received. Theodore ascended the throne of the archiepiscopal see, while Benedict, at his request, undertook the government of the monastery of St. Peter and St. Paul (St. Augustine's) in the same city. 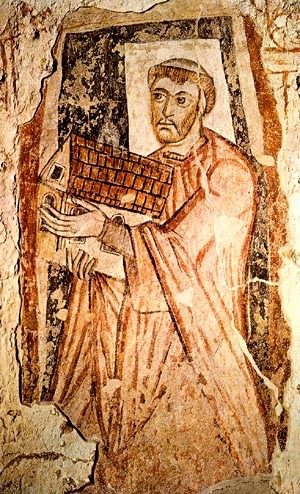 Here Benedict laboured for two years, at the end of which the indefatigable traveller paid a fourth visit to Rome, "with his usual good success," says Bede. England was at that time behind the countries of the continent, both in arts and in literature, and Benedict had probably felt the lack of books from which to teach the scholars whom he gathered around him at Canterbury. He undertook this journey for the purpose of supplying the want he had experienced. Nor was his journey in vain, "he brought back with him no inconsiderable number of books on every branch of sacred literature, which he had either bought at a price or received as presents from his friends." On his return to England he bent his steps northward, being anxious to revisit his own people and the region in which he had been born: and so came to the kingdom of Northumbria. Here, he was well received by King Egfrith, to whom he gave a glowing account of the foreign monasteries and schools of learning and displayed the treasures that he had secured on his journey. The King caught Benedict's enthusiasm and, in AD 674, gave him a tract of land where he might found a monastery; and here, in a short time, rose the walls of the monastery of St. Peter at Wearmouth, on the left bank of the river from which the spot takes its name. Benedict must have been a good sailor, for he had to go far and cross the sea before he could find men capable of building a church of stone in the Romanesque style; but nothing daunted, he crossed over to France and brought back with him masons ready and able to do the work he wanted. If a stone church was a rarity in those days, glazed windows were positively unknown in this country; but Benedict was determined that nothing should be wanting to his new church, and so sent messengers again to France. Bede's account of this is curious and interesting. "He sent messengers," he tells us, "to bring over glass-makers (a kind of workman hitherto unknown in Britain) to glaze the windows of the church, and its aisles and chancels. And so it happened that when they came they not only accomplished that particular work which was required of them, but from this time they caused the English nation to understand and learn this kind of handicraft, which was of no inconsiderable utility for the enclosing of the lamps of the church, or for various uses to which vessels are put." Great was the astonishment of the good folk of Northumbria at this innovation introduced first in the church of Monkwearmouth, and shortly afterwards, in Jarrow. So much so that a tradition sprang up, which was handed down for many generations, that, because of its glazed windows, it never was dark in old Jarrow church. Once the building was finished and Benedict had ransacked the treasures of France to provide "whatever related to the ministry of the altar and the church and holy vessels and vestments." But there were still some things that he wanted, which he could not discover even in France, and so, in AD 679, he set out for a fifth time for Rome. Here he obtained all that he could desire and returned literally laden with spoil. 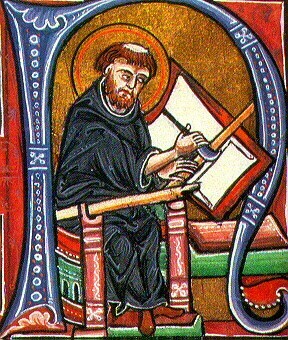 In the first place, says Bede, he imported a numberless collection of all kinds of books; secondly, he introduced some relics of the saints, which were highly esteemed in those days; thirdly, he brought in to his own monastery the order of chanting, singing and ministering in the church, according to the Roman manner - bringing back with him a precentor, John by name, who was to become the future master of his own monastery, and of the English nation; fourthly, he obtained, from the Pope, with the express permission of the King, a grant of certain privileges to his monastery; and lastly, he carried home with him paintings of holy subjects for the ornamentation of the church. There were paintings of the Blessed Virgin and of the Apostles at the east end; along the south side ran a series of figures of the Gospel history, while the north wall was filled with the sublime images of the Visions of St. John the Divine in the Revelation. We are told his reason for thus decorating his church was "to the intent that all who entered the church, even if ignorant of letters, might be able to contemplate, in what direction so ever they looked, the ever gracious countenance of Christ and his saints, even though it were in a representation; or, with a more wakeful mind, might be reminded of the grace of our Lord's incarnation or, having as it were, the strictness of the last judgment before their eyes, should thereby be cautioned to examine themselves with more narrow scrutiny." And so his great work was finished, and the monastery which he founded rapidly grew and flourished, so that, in the short space of a year (AD 682), he sent out from it a colony of twenty-two monks, under St. Ceolfrith, and founded a sister monastery of St. Paul at Jarrow, with the hope "that mutual peace and concord, mutual and perpetual affection and kindness should be continued between the two places." Scarcely ten miles apart, the two monasteries were to all intents and purposes but one. Benedict was now growing old; but his new church at Jarrow was to be no less glorious than that at Wearmouth, and so, in spite of age and infirmities, in AD 685, he crossed the sea once more, and for the sixth and last time repaired to Rome; "returning, as was his custom, enriched with countless gifts for ecclesiastical purposes, with a large supply of sacred volumes and no less an abundance of paintings than on previous occasions. Some of these were scenes from the life of our Lord, which he placed in the old church; while, for the church of Jarrow, he brought back an excellent series of paintings showing the harmony between the Old and the New Testaments. For instance, side by side, the paintings represented such subjects as Isaac bearing the wood on which he was to be slain and our Lord carrying the cross on which he was to suffer; or the serpent raised up by Moses in the wilderness, and the Son of Man exalted upon the cross." Thus he lived long enough to see both monasteries fairly at work and their buildings completed, and then his work was over. Shortly after his return from Rome, he was seized with a creeping paralysis. For three years, the disease gradually gained upon him, yet he never lost his cheerfulness, nor ceased to praise God and exhort the brethren. He was often troubled by sleepless nights, when, to alleviate his weariness, he would call one of his monks and desire to have read to him the story of the patience of Job, or some other passage of scripture by which a sick man might be comforted, or one bent down by infirmities might be more spiritually raised to heavenly things. Nor did he neglect the regular hours of prayer, but as he was unable to rise from his bed to prayer and could scarcely raise his voice in praise, he would call some of the brethren to him that they might sing the psalms in two choirs, he himself joining with them to the best of his ability. Eventually, the end came. On 12th January AD 690, he died as he had lived, surrounded by the brethren of the monasteries of his own creation, and was buried in the stone church that he had reared at Wearmouth, in the midst of the treasures that he had collected. From the book Northumbrian Saints (1884).